Your First (Modern) Quilt E-Course Registration OPEN! Are you ready? Because it is time to rock down to Electric Avenue. Beginning October 24, join the Your First (Modern) Quilt class online, from the comfort of your very own internet connection, and learn the basics of modern quilting. You’ll work your way through the fundamentals of quilting skills, from cutting straight to making half-square triangles to basting and binding, all while making a complete quilt from start to finish. 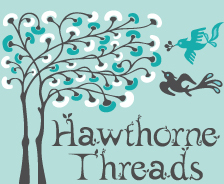 I love, love, love this class and have had such an amazing time teaching it this year–and I’m delighted to offer it as a daily online course for the first time this fall! 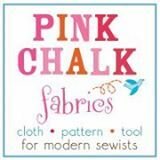 If you’ve been dabbling in quilting, or are looking for motivation to begin your own quilt, look no further. 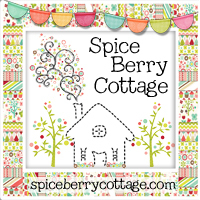 Join the class and have a finished quilt by Thanksgiving! 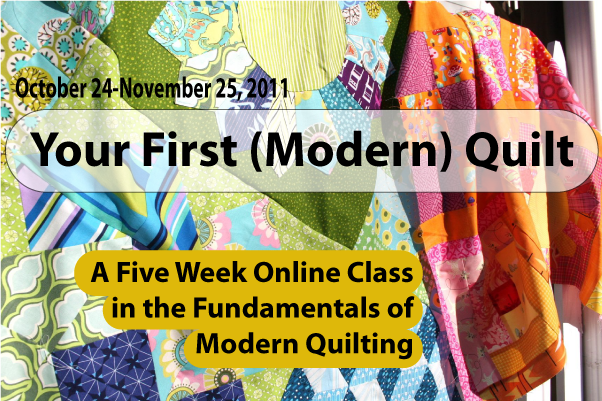 See all the details and register online for the Your First (Modern) Quilt e-course–I’m looking forward to having you join me! It’s not in the budget right now, but this class looks *just* like what I’ve been looking for. I hope you’ll be offering it again! Scondy– I hope so, too! We’ll miss having you there! Sounds like an awesome class, but not sure I can do it with a full time job too. How long are the daily online sessions? Stacey– On average, it works out to be about 30-45 minutes a day, so not too extensive. Plus, since each lesson goes up and stays up for the duration of the class (in this case, content will be live and available through the end of January 2012), you can work at whatever pace you choose! I’ve certainly had other e-course students who work full time and took a class and it was great for them. Let me know if you have any other concerns or questions, though, and I’m more than happy to answer them! I was *just* wishing for something like this, but I fear that committing five nights a week over five weeks might be a bit much at this time of year. I’m attempting holiday crafting for the first time this year, and am already in progress on a couple of things. Boo! Please offer it again! We’ll miss you! The sewing works out to 30-45 minutes a day, on average, so it’s really not too cumbersome–but I totally understand that crafting a handmade holiday can cut into your time! Hope it’s amazing and beautiful, and that you’ll join us next time, yes? And make some gingerbread for me! It’s my favorite. I like to bite off the heads. Oh, wait…maybe I shouldn’t say that out loud. Yeah! Just signed up. Can’t wait! 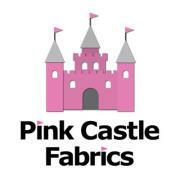 Will you be telling us soon how much fabric we’ll need and what the quilt will look like? I’ve been saving my Little Folks voile and flannel for a quilt, but I can’t tell if this is the fabric I’ll want to use for a sampler quilt. 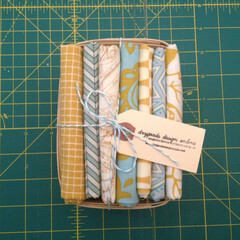 I had planned to do something simple (i.e., 5.5″ squares only) so the fabrics would really be shown off. ? Thanks!! Hooray!! So excited you’ll be part of the class! Already shaping up to be a SUPER fun group–I can’t wait to get started.